“There’s tribes all across the United States, but when you walk down the streets, how many American Indians do you see? We are not extinct. For we have survived and we are here,” said Mark Tayac, 29th Generation Chief of the Piscataway Indian Nation. 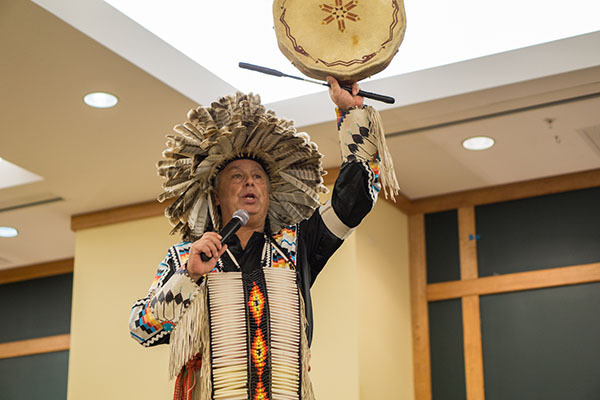 On Nov. 14, McDaniel’s Office of Student Diversity and Inclusion (OSDI) celebrated Native American Heritage Month with cultural performances from Mark Tayac and the Piscataway Indian Nation Singers and Dancers. 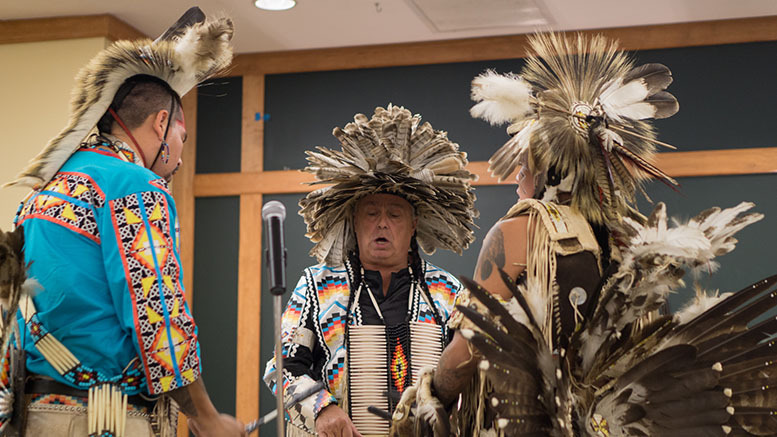 In garments made of feathers, animal skin, and more, the performers highlighted traditional song and dance to raise awareness of American Indian culture in the U.S.
From Western “Cowboy and Indian” films, to sports teams using tribal mascots, to cartoons like Pocahontas, the performers seek to dismantle societal representations of American Indians and replace them with the truth. “We’re able to share the beauty of our culture, but we’re able to tell the history of our people from our voices – the trials and tribulation,” Tayac said. As for students reactions, over 15 audience members volunteered to take part in acts like playing “stickball,” or modern-day lacrosse, and the rabbit dance, a social dance used to strengthen bonds in youth dating and friendships. “There were some students that came and said ‘I’m going because I have American Indian blood or heritage.’ For them to see that and take pride in it, it means a lot,” Moreno said. Throughout the show, the performers connected to the audience with both traditional and modern animal dances like the “Eagle Dance,” which signifies the birth and guidance of the eagle. Drumming was also a key component of the show. Tayac emphasized that the drum represents the heartbeat of life. For American Indians, as long as the drum goes on, the tribe goes on. Out of the show, Mark Tayac and the performers wore regular attire, attempting to show that their people work regular jobs and live in regular homes, like everyone else. Mark Tayac. Photo by Kyle Parks. Why Should Students Care About the 2016 Presidential Election?